Nothing pumps us up more than Kenny Loggins’ 1980s hit “Danger Zone.” Sure, Tom Cruise has gone a little cray since Top Gun, but most of us at Reactuate Games can still get a rush from the adrenaline-inducing tune, which is a part of Ron’s special morning playlist. And as the second week got under way, we learned more about Ron’s music tastes (hint: he has the Xena theme song in there, too), our game, and each other. The Reactuate Games team received more info on the game this week and shared the Super Secret Game Design document with email subscribers. This file explains the backstory of Colony Manager (possibly changing to Colony Maker) and how the player advances through the game. We shared this as a thank-you to our subscribers, so if you’re interested in the original design for the game, sign up here. We’re actually creating graphics for the game now, too! Sam drew up a spiffy rocket ship, Austin played around with some terrain, and Katey created a monkey for scale purposes. Slowly but surely, the RG team is moving along. Katey’s monkey on a mountain. Cute, huh? Last week, we also took a field trip to The Gathering Place, an Abilene hotspot for gamers to hang out, compete, and play all kinds of games. We met with them in hopes to sponsor an event in the near future or at least get the word out to our Abilene audience. Afterward, we stopped by 7-11 for much-needed Slurpies to rehydrate and refuel before getting back to the office. Because work is hard and stuff. 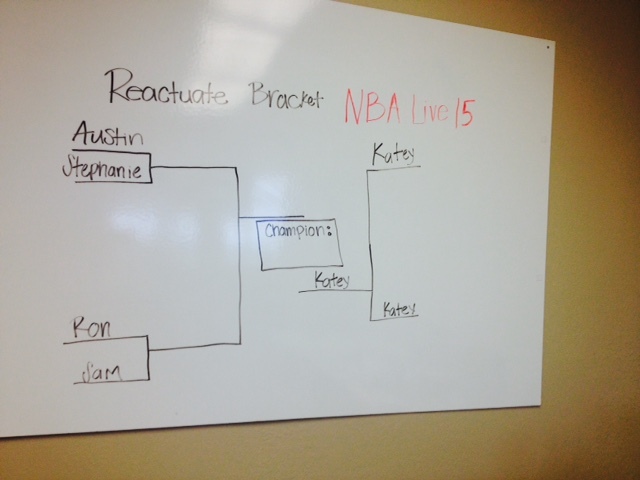 On Friday, we had some Internet connectivity issues, which hindered our Twitch stream some, but that didn’t stop us from battling in our NBA Live 15 bracket and meeting a few new followers when we were broadcasting. 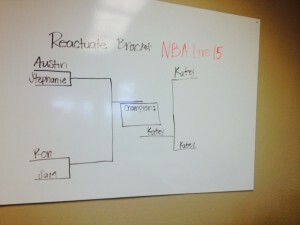 Katey came out on top (*cough*… it was her game…*cough*), but it was a fun team-building experience, and we learned a lot about how gamers should get to skip tutorials, i.e., we spent thirty minutes watching our fearless leader learn to dunk. Our second week together came and went quickly. The constant sound of mouse clicks filled the office, as we accomplished many of our week’s goals and built a sturdy foundation for our game and our company. And I personal can say it’s all due to Kenny Loggins. Now on to week three! P.S. Need some motivation? Watch a 1986 Cruise fly really fast.